Another quick and easy recipe. I tried to make it as clean as possible but couldn’t find whole-wheat farfalle pasta. 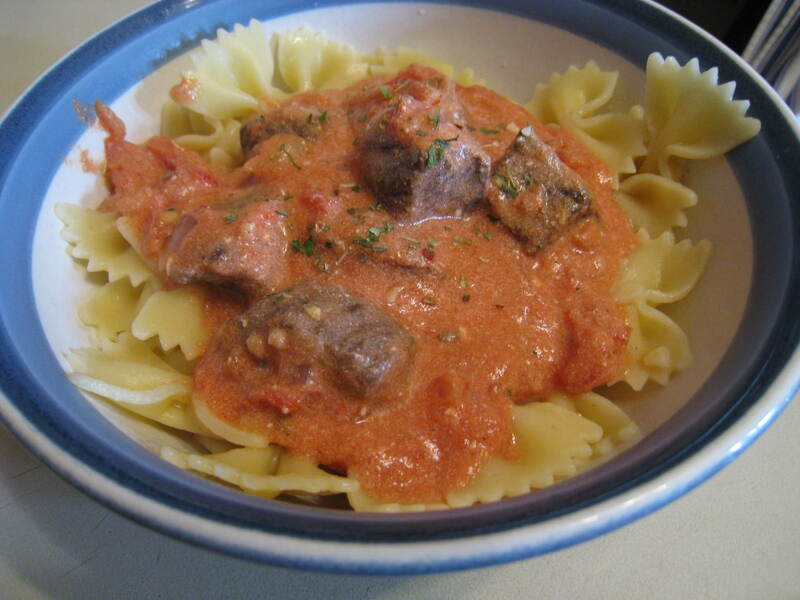 The sauce is so much lighter than most creamy sauces because it’s tomato based and low-fat sour cream is used. Prepare marinade using a small bowl. Whisk together the garlic, vinegar, dijon, cinnamon and pepper. Pour marinade over stek cubes in another container, cover and refrigerate for at least 1 hour or overnight. Drain steak cubes and discard marinade. Heat a large non-stick skillet over high heat for 1 minute. Reduce heat to medium-high heat, mist with cooking spreay and saute steak until browned on each side about 4 minutes total. Remove steak from pan and set aside. Mist same pan with cooking spray again, add onion and remaining 2 cloves garlic and saute until browned about 2-3 minutes. Add tomatoes and reduce heat to medium low. Add seasoning, basil and sour cream and combine. Cook for an additional 2 to 3 minutes then mix in reserved steak and cook for 2 more minutes until meat and sauce are completely warmed. Serve 1 cup of pasta with 3/4 cup steak sauce. Garnish with an additional sprinkling of italian seasoning, if desired.